Quick release plate is included,easy to setup and adjust. The powerful capacity and high-flexibility allows all-round stable shooting. Bidirectional base plate with fine adjustment system can be adjusted freely to any direction. It can be extended from 15.2" to 24" to adapt to the weight of the camera. The Quick Release Plate can accept any camera with 1/4" and 3/8". 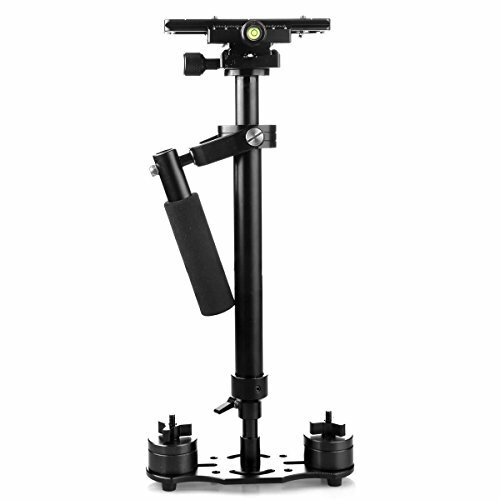 40cm（0.4M）-60cm(0.6M) Handheld Stabilizer The weights are included. Pls feel free to contact us if you don't know how to balance it. Allows high and low angle shooting, high precision bearings and low friction joints. Stretch adjustment improves weight ratio, and reduces the clump weights greatly. If you have any questions about this product by YaeCCC, contact us by completing and submitting the form below. If you are looking for a specif part number, please include it with your message.